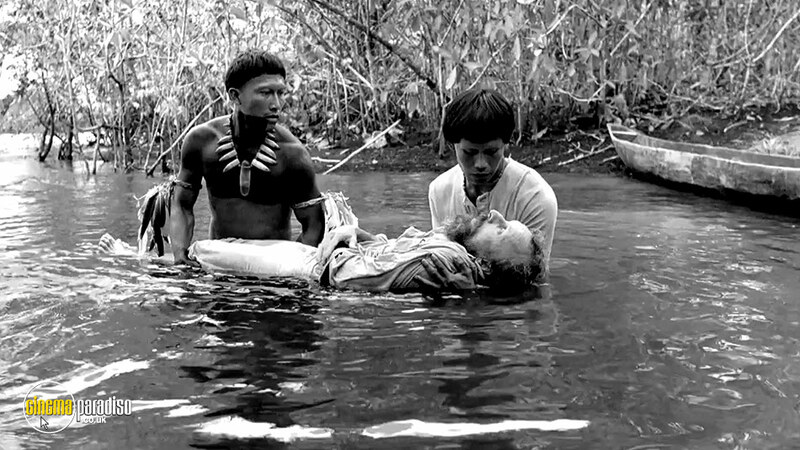 Beautifully shot in black and white – a rarity these days – Ciro Guerro’s Embrace of the Serpent is Columbia’s nominee for Best Foreign Language Film, and deservedly so. An “elegy for lost cultures and an indictment of exploitation,” this saga of human endurance in the wilderness – also the theme of fellow Oscar nominee The Revenant – plays like “a rainforest fever dream.” Critics Daniel Barnes and Dennis Harvey present their takes on this vivid physical adventure, which opens across North America in February and March. 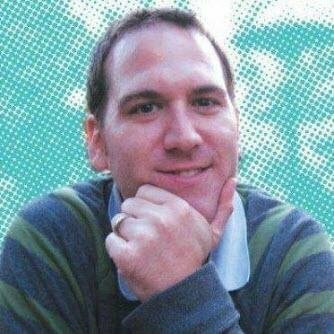 Read our question-and-answer session with Spirit director Guerro. Official site. The inherent problem with making a movie about indigenous peoples is that the natives are inevitably portrayed and judged through a Western prism, one usually teeming with condescension and miscomprehension. Some of these indigenous cultures are extinct, so it’s practically impossible to make a movie about them that’s not a winner’s history, and the standard-issue presence of a white male protagonist meant to serve as our “guide” into an exotic world doesn’t exactly help. It’s been a good 50 or so years since the majority of commercial feature films (in the U.S. at least, with other countries not too far behind) were being made in color — a format once reserved only for the major studios’ most prestigious and/or expensive productions. By 1970, black-and-white movies were already an anomaly, relegated to the rare, very low-budget indie or the even rarer major release (like Peter Bogdanovich’s Last Picture Show and Paper Moon) that chose monochrome for its nostalgic connotations. 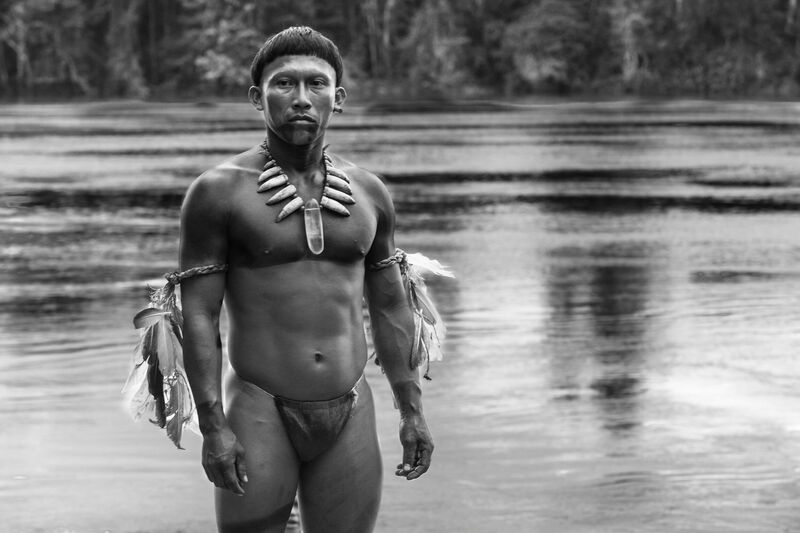 Colombian writer-director Ciro Guerra’s languidly hallucinatory Amazon adventure Embrace of the Serpent (sort of) solves this problem in an interesting way. 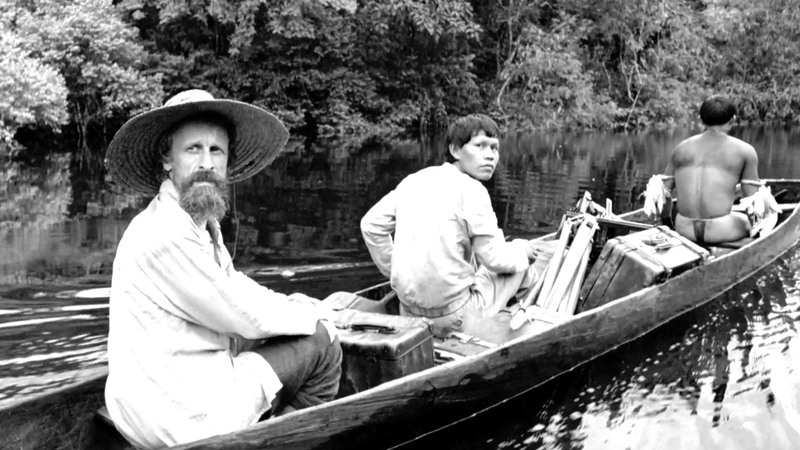 Although Guerra based his script on the diaries of two white explorers separated by decades, German ethnologist Theodor Koch-Grunberg and American biologist Richard Evans Schultes, the story is largely viewed through the eyes of Karamakate, “the world mover,” an isolated shaman and presumed last of his tribe who encounters both men 40 years apart. Niblio Torres plays Karamakate as a fiery youth, and Antonio Bolivar plays him as a pot-bellied older man. Young Karamakate first meets the dreamless Theo and his dark-skinned, pants-wearing man-servant Manduca when they come seeking his help. Theo is slowly dying, and Karamakate assesses that only the sacred hallucinatory plant Yakruna can save his life. When Theo claims to possess information about Karamakate’s lost tribespeople, the skeptical shaman agrees to lead them upriver in search of Yakruna. Forty years later, another bearded white man who can’t dream comes rowing up the same river looking for Yakruna, only Karamakate has forgotten everything by now, while the white man has the benefit of Theo’s published diaries. Foggy and living in a ghost-like isolation, endlessly drawing figures he doesn’t understand any more, the older Karamakate is re-awakened by this link to his past. He asks to tag along on the same journey upriver, his memory gradually returning as he retraces the steps of his youth. Guerra divides his two-pronged narrative patiently instead of urgently, and so even when it works well, it makes for a loosely plotted and somewhat meandering movie. 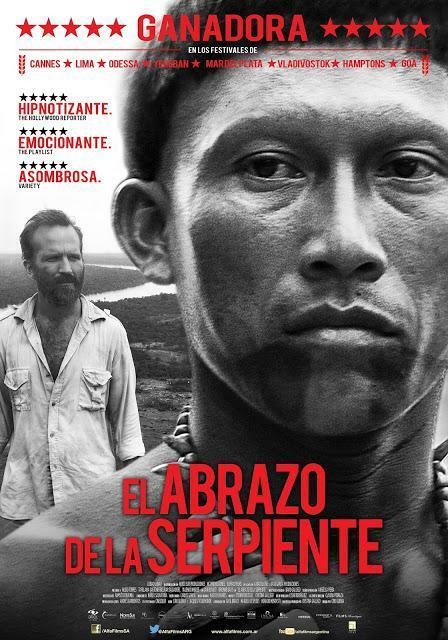 If you give Embrace of the Serpent the time and space it needs to build its world, though, the film can be quite entrancing, an episodic jungle adventure a la Apocalypse Now with flashes of a Herzog-ian rainforest fever dream. It’s an elegy for lost cultures and an indictment of exploitation only occasionally waylaid by its own dreary good intentions. In Guerra’s heart-of-darkness vision, the closer we get to the “civilized” world, the more perverted the natural order becomes. As Karamakate and the explorers move from the forest tribes to the rubber plantations to the missions, nothing feels untouched by western exploitation. Even these two small bands of travelers taint every culture and ecosystem that they encounter, whether inadvertently introducing a compass to an isolated tribe or kicking over rubber pails tended by a one-armed slave. Even when a weed is pulled, something worse grows in its place. In the film’s most arresting sequences, the groups come upon a forest mission. When Karamakate arrives with Theo and Manduca, it’s a sadomasochistic hell house where kidnapped native children are routinely tortured by priests. Four decades later and the priests are gone, but that same mission serves as headquarters for a half-Catholic, half-pagan cult ruled by a vile messiah. “They are now the worst of both worlds,” says Karamakate. This is the third film from Guerra, and his first since The Wind Journeys in 2009. Guerra and cinematographer David Gallego make excellent use of black-and-white photography here, refusing to indulge like tourists in the lush greenery of the jungle. 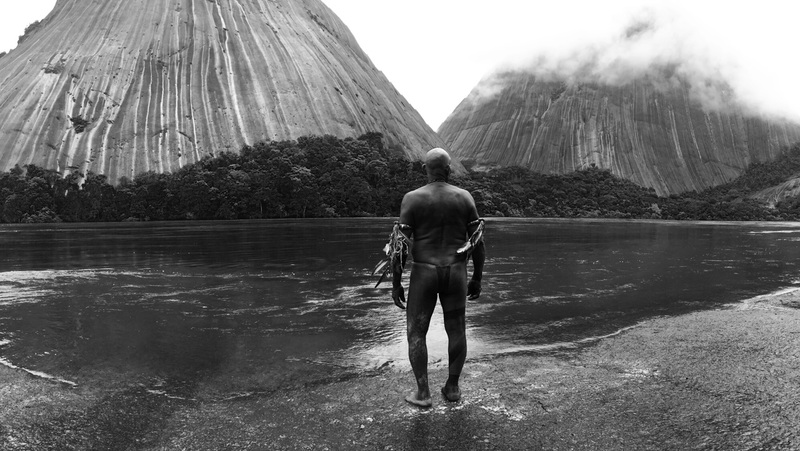 In fact, Embrace of the Serpent is one of the whitest black-and-white movies I’ve ever seen, almost blinding at times. The style feels equally indebted to history and hallucination, just right for a film about the link between memories and dreams. Ergo, seeing a new B&W movie today often feels like a special occasion. They still do turn up, as recent arthouse releases such as Romania’s Aferim!, latter-day “silent” films The Artist and Biancanieves, and relatively mainstream movies like Nebraska, Frances Ha and the Sin City series. There are even leading filmmakers who frequently use the format, including the Coen brothers, Canada’s Guy Maddin, French veteran Philippe Garrel and Hungarian Bela Tarr (though he supposedly retired after 2011’s The Turin Horse). However, it would be very easy for even a regular movie enthusiast to go an entire year without seeing a B&W film, unless they catch something from Hollywood’s “golden age” at home or at a repertory house. The occasional “classic” revival aside, so seldom do we see black and white on the big screen nowadays that the experience of doing so can be thrilling, like any form of spectacle that your eyes are unaccustomed to. 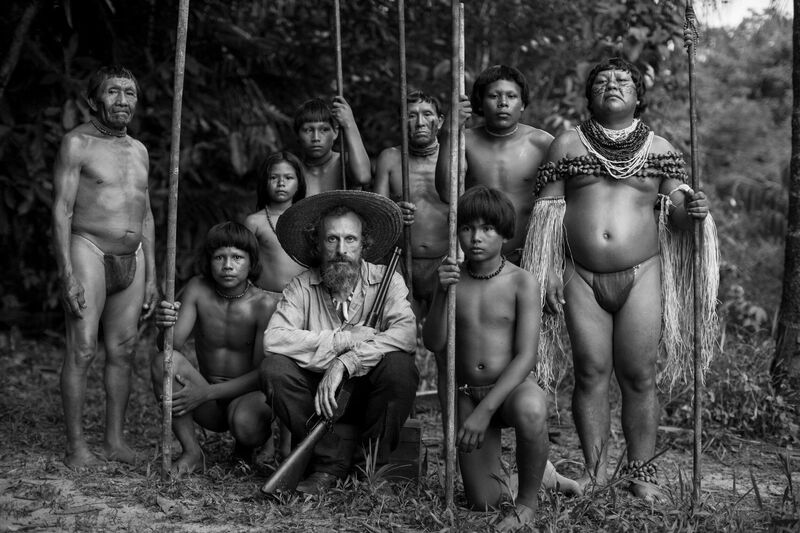 That’s certainly the case with Ciro Guerra’s Embrace of the Serpent, which opens Friday, Feb. 26 – and on Sunday, Feb. 28, will try its luck as the first-ever Colombian Best Foreign Film Oscar nominee. 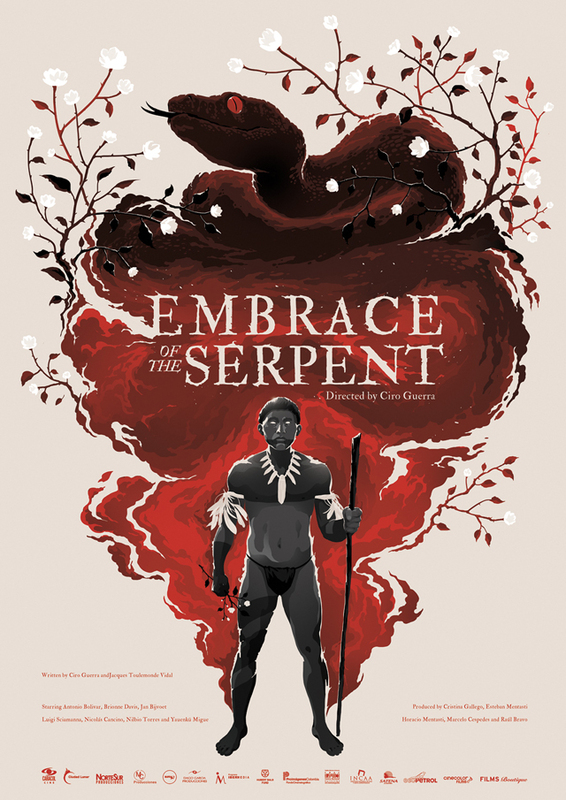 Serpent, which is based loosely on the diaries of two scientific researchers exploring Colombia’s Amazonia (one in 1909, another 21 years later), is a gorgeous physical adventure that echoes fellow Oscar nominee The Revenant in its tale of human endurance amidst imposing wilderness (and perilous other humans). Its more mystical, spiritual side may also recall Werner Herzog’s many filmic journeys into exotically alien landscapes and cultures. But the monochrome imagery of David Gallego’s arresting widescreen cinematography imprints itself on the eye and mind in a distinctive, almost primordial manner, as if the film itself were a relic of some parallel time outside the conventional history of man’s achievements and misdeeds. The script by Guerra and Jacques Toulemonde Vidal weaves smoothly if unpredictably between two well-spaced river trips undertaken by a lone colonialist explorer and a local tribal shaman. In one, ailing German ethnographer Theo (Jan Bijvoet) and his amicable guide Manduca (Miguel Dionisio Ramos) are forced to seek assistance from elusive “world mover” Karamakate (Nilbio Torres), a slaughtered tribe’s lone survivor. He purportedly knows the whereabouts of a possibly healing, possibly mythological plant. A generation later, American scholar Evans (Brionne Davis) attempts to retrace his long-since-disappeared predecessor’s path, again reluctantly helped by a (much older) native (Antonio Bolivar Salvado) whose connection to the prior journey isn’t immediately clear. In both cases, the travelers confront brutal evidence of the environmental and human devastation wrought by foreign “rubber barons” who’ve treated both nature and natives as cheap resources to despoil. Where Manduca hopes Theo’s more enlightened interest can forge a cooperative future between those who’ve always inhabited this land and those who’ve come to exploit it, Karamakate is bitterly resistant. He barks, “I’m not like you — I don’t help the whites.” Yet the spiritual forces he perceives everywhere instruct him to help this one, just as later on Evans benefits from a similar, grudging largess. Part of that help means trying to teach that “Every plant, every tree, every flower is full of wisdom” — a wisdom beyond academic cataloguing that may require the use of sacred hallucinogenic herbs for these European-heritage men to grasp. In such sequences Serpent echoes the psychedelic questing of Alejandro Jodoworsky’s early work (El Topo, The Holy Mountain). In its most harrowing sequences, involving a remote Catholic mission turned nightmare distortion of organized “salvation,” Guerra recalls that filmmaker’s most savage critiques of religious hypocrisy. But despite those passages — and the very clear message about First World destruction of Mother Earth, then and now — Guerra’s third feature is not a dirge-like indictment of “civilization’s” horrors. Instead, it plunges us into both frightening and beautiful aspects of “the infinite jungle” as a sort of spiritual cleanser. This viewer’s-own journey may find you a little spacey at the end; enchanted, yet safely back on terra firma. It’s a bracing movie whose stunning visuals — blacks so deep they’re like looking into water on a moonless night — leave you startled and somehow more awake, as if you’d just pulled your head from a deliciously cool lake. Read why this year’s Best Foreign Film nominees might be the most exciting and diverse group in years according to Eric Kohn of Indiewire. EatDrinkFilms has also featured two other Best Foreign Language Film selections, Hungary’s Son of Saul (Critics Corner and interviews) and last week, Denmark’s A War. 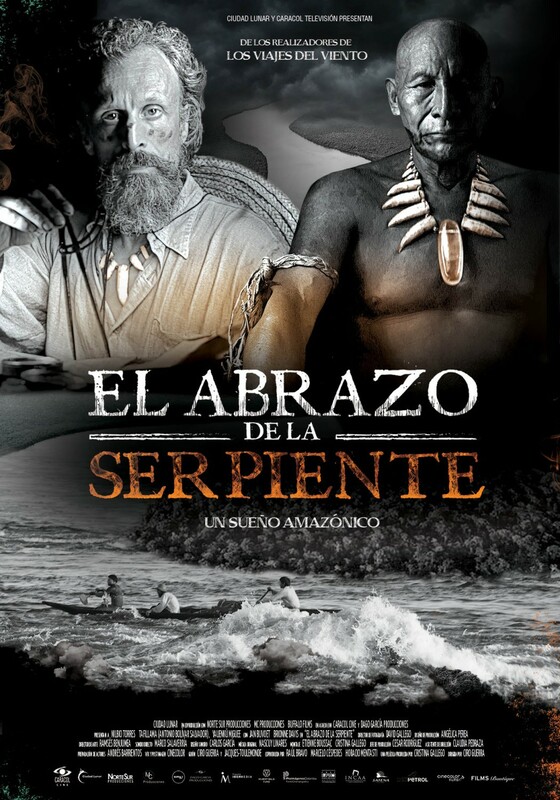 This entry was posted in Columnists, Films, Films: Critics Corner and tagged Ciro Guerro, Critics Corner, Daniel Barnes, Dennis Harvey, Embrace of the Serpent, Films. Bookmark the permalink.